Short recap on what is Git: Git is a distributed repository. Everyone has its own copy of all files from the project (Repo) stored on their computer. Advantage of Git is that every user in the project team can work offline. In this post we take a closer look on the commands that are available in Git and when they can be used. git config –system user.email user@domain.com – This is a setting on the system config file. git config –local user.email user@domain.com – This is a setting on the Repo Config file. 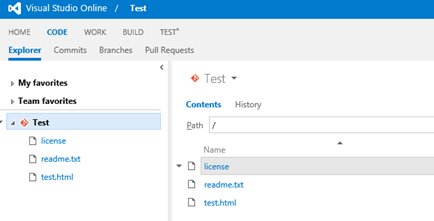 In my blogpost on using Git for PowerShell Versioning with Visual Studio Online we initiated the Repo on VS Online and cloned it to our computer. In the next steps we do it the other way around. Let’s assume you already have a folder with scripts or a project in it. Note that the exclamation mark may also be standing between the symbol and the number like: [master +1 ~!1 –!1], that means there are conflict when you try to merge branches for example. If the numbers are red it means that there are unstaged files and if they are green they are staged and ready to commit. You noticed that the master color is blue. When we commit the changes you notice that the color of master becomes green. 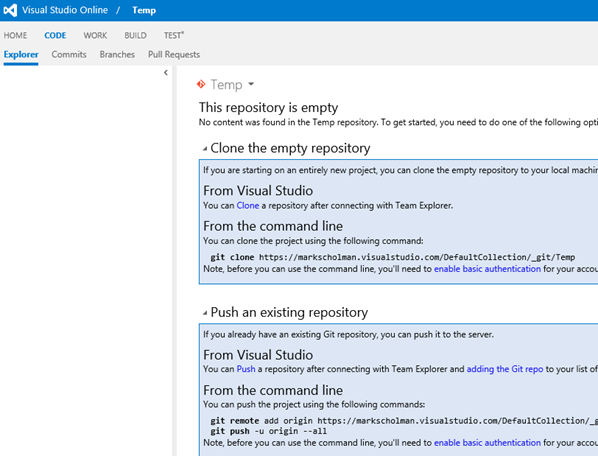 After we pushed them to GitHub or VSOnline the color becomes blue again. In our example above we were only working on the local repo and didn’t even pushed it to an online repo so it remains blue. We will do this in the next step. 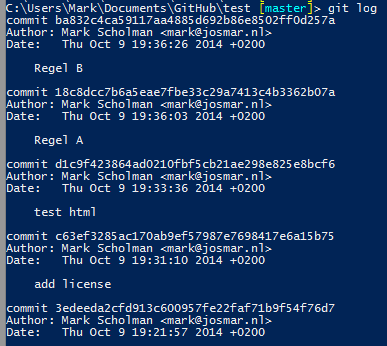 So you see that even without an online server we can start using git. 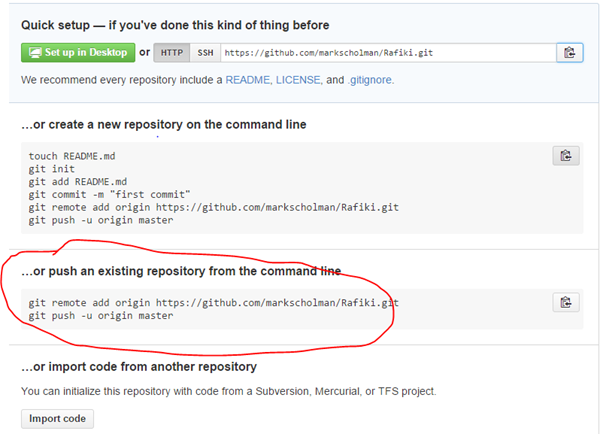 Now use git push –u origin master to push the local repo to GitHub. The –u is used so the next time we only need to run git push. This is remembered for the repository and don’t need to be reentered when you switched repositories for example. 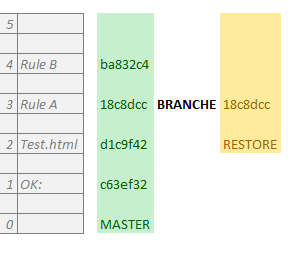 A branch is a full copy of the master where we can create modification apart from the master branch. This becomes useful when you working on some features for a project on a separate team and you also need to update the production branch. Now push the repo to GitHub by running git push. You see that if you did pushed your repo to your online repository it takes a lot of effort to revert back to an earlier commit. As long you didn’t pushed your repo to GitHub or VSOnline the git reset –hard HEAD^ will be enough to revert back to the last commit or git reset –hard HEAD^^ for the last 2 commits to revert. You can use git reset –soft HEAD^ to undo a commit back to staging area. This might be useful if you want to add some more files to the staging area what needs to be in the same commit. I advise you to get started with a test project and play with files and git commands to see what happens. For example when switching branches and files are not available in other branches you won’t see them in you directory anymore. This can be panicking the first time when you experience this, I did at least. 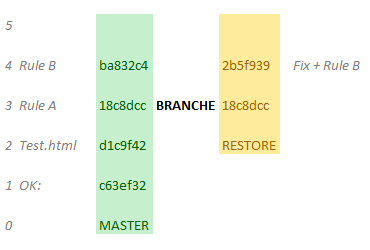 When you switch back, the changes and commits that belong to that branch are back. There a lot more commands available in git like rebase instead of merging also with recovering files from commits there are some need features available. I will discuss this topic in a future blog post. DevOps, Git, PowerShell, VisualStudio. Bookmark.